Delivering the convocation address Dr. Arvind Subramanian, congratulated all the graduating students and gave valuable advice on the road ahead. He advised the students to stay away from the gloomy news and negativity and suggested that despite challenges, this is going to be the golden age for developing countries like India, where many economic indicators are very promising. Compared to his graduation days, he claimed that the opportunities now are wider and the future is going to be brighter, prosperous, dynamic and full of opportunities. The graduation pledge was taken after the inaugural address and the Chief Guest presented the Certificates to the graduating students. 180 PGDM Students, 24 students of the Working Executives Programme and 3 PhD scholars were awarded the graduation certificates. The Vision of Institute for Financial Management and Research (IFMR) is to prepare young minds and experienced managers to become competent and socially responsible leaders of corporations and other institutions. Established in 1970 as a not-for-profit society, the IFMR is a leading business school. It has recently inaugurated a sprawling 40 acre campus in Sri City with a student strength of 360. Located in a manufacturing hub comprising some of the world’s leading companies, the campus provides stu-dents and faculty with world class infrastructure and outstanding opportunities for collaboration with industry. 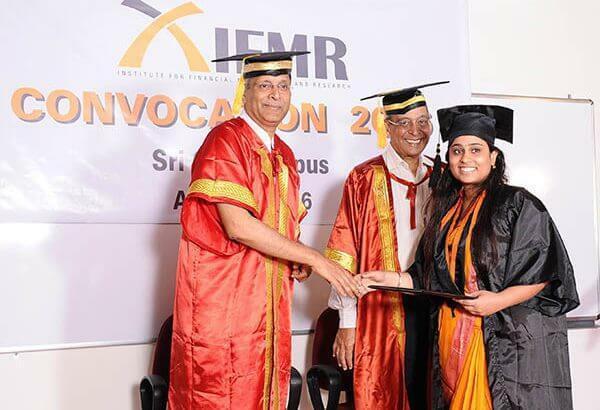 IFMR’s curriculum offers a mix of theory with simulated real life exposure and endeavours to shape global business practices through inventive, sharp thinking and cutting-edge research. IFMR currently offers full-time and part-time PGDM programmes, a Ph.D programme as well as both open and customised management development programmes.